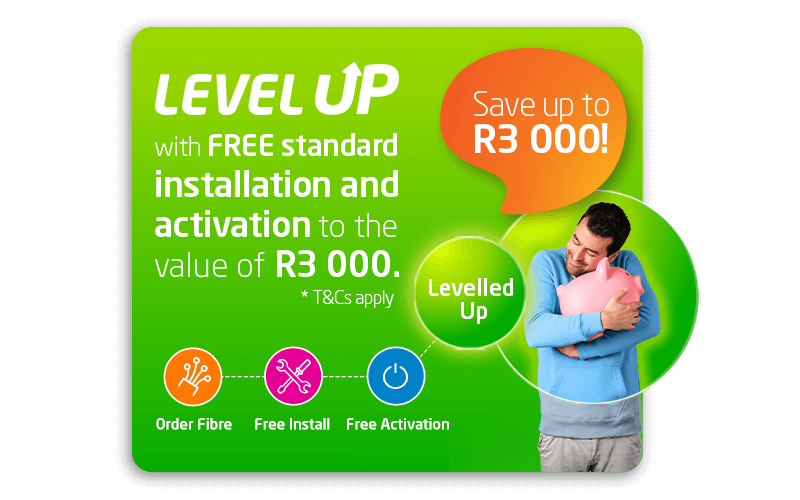 Get FREE standard installation and activation to the value of R3000* when you level up with Vox Fibre to the home (FTTH). With Vox Fibre you have instant access to everything from live streaming, DIY hacks, online cooking, online shopping and so much more. Live smart and hack life with Vox Fibre. Connect with friends and family all over the world without the scary telephone bills: Experience crystal clear VoIP calls and lag-free video calling on your fibre connection. Forget about buffering: stream rich HD content like films, series and music, including smooth video-on-demand playback and online gaming. Plus, speedy downloading! Surfers paradise: with fibre-fast connectivity you can quickly send and receive large files, access video conferencing, and make the most of cloud-based services. Convert your house into a smart home, linking IP security cameras, smart sensors, lighting and other Internet of Things devices all to your fibre connection. How does fibre differ from ADSL? ADSL runs over existing copper wire infrastructure which is often unreliable, heavily contended and offers average speeds of around 4Mbps. Fibre, on the other hand, transmits information as light impulses along flexible glass fibres at incredible speed, allowing users to achieve speeds of up to 1000mbps. Fibre connections are around 250 times faster than ADSL ones. Do I need a voice line/number? Do I need a different router/modem? The router needs to be compatible with fibre. Vox will provide you with the appropriate router/modem with your package of choice. Can I make calls over my fibre line?